Lindeman Lake is a hike that has been sitting atop my bucket list for a couple years now. However; with the long drive and lack of cell phone service I was always concerned to do it on my own. So, last week I convinced a couple mom’s that this it was our time to cross this from our list and we went out and conquered it. The drive up the Chilliwack River Valley is beautiful and much more enjoyable when you have a couple friends along for the ride. From Abbotsford, the drive to the trailhead was just over an hour but a really easy one as it’s paved the entire way. As we arrived at the large parking lot we were surprised by the number of vehicles already here. After a quick outhouse break, we headed for the well-marked trail. At first the trail seemed like a walk in the park but once we hit the rocks and the trail became more technical I began to understand why it was rated as moderate hike compared to a beginner hike. 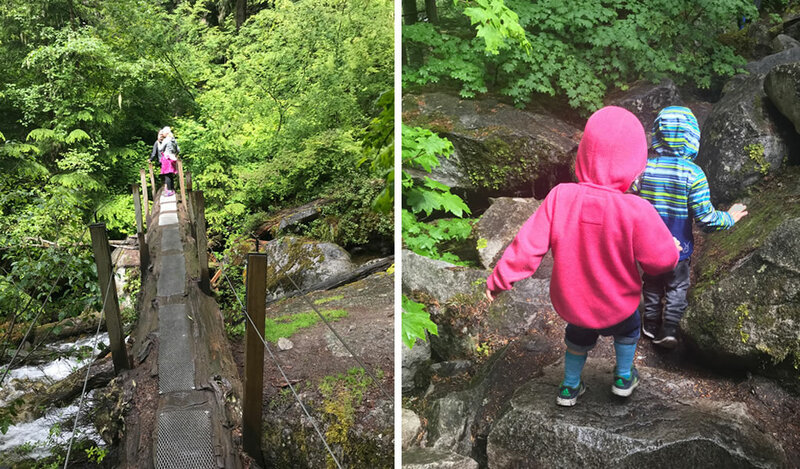 However; my 3yr old daughter and nephew tackled those rocks like rock stars needing minimal assistance when the ledges were taller than them. Again, we chose a rainy day for our hike, so some of the log crossing and tree roots were fairly slippery even with hiking boots on. A word of caution when crossing the log just after the wooden bridge. Be sure to take your time as the log is slippery during wet and moist weather. You don’t want to fall into the river below. Large moss-covered rocks, and technical terrain gives this trail a challenge. An impressively large granite rock takes you by surprise is a great place to snap some photos. Continue up the steep parts with caution but don’t turn back, you don’t want to miss what lies ahead. As the trees start to thin out and the sky becomes lighter you are first welcomed by an assortment of wooden tent pads and a camper’s outhouse (Something new to add to my bucket list). Then comes the lake! The breathtaking turquoise glacier waters of Lindeman Lake open up to you as you approach the first and main stop of the trail. This open area is a beautiful place to stop for a snack or lunch. The frigid waters are fine for swimming (for those who aren’t afraid of the cold temperatures) and have a great population of trout for the fishermen. We stayed here to enjoy our lunch and a great conversation amongst friends before deciding to turn back to go home. With the kids, we were able to make it to the lake and back to our vehicles in just over two hours. Another day when time permits, I hope to continue past our turnaround point and take an entire day to explore Greendrop Lake and Flora Lake. As this more difficult route is for experienced hikers it’s not one I plan on doing with my daughter in tow. However, I do plan on returning and bringing the kids for an overnighter this summer. What a treat that will be.